Today's So Shoe Me is the Mischa Ruffle Flat by Kelsi Dagger, $100 $50, available at Moxsie.﻿ Just in time for spring indie boutique extraordinaire, Moxsie, has put these modern and feminine bright yellow flats on sale. A chic staple in a modern rounded flat shape but a dainty feminine detail in the frills at the back makes it more exciting that the everyday ballet flat, I also love the nautical inspired rope lacing at the back. 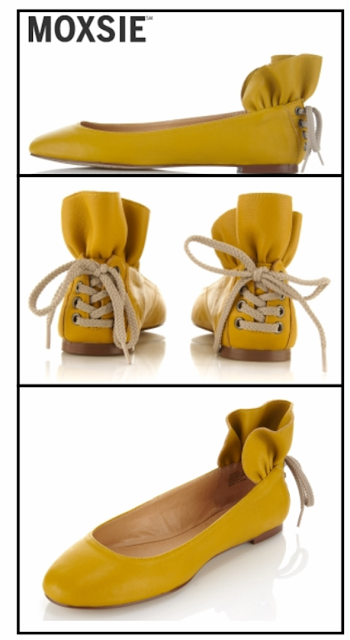 It gives this bright yellow shoe another added detail and casual sensibility. Hitting all the style notes you need for this spring (bright color, woven laces and simply modern) this is the perfect flat to wear all season. Pair with a vintage inspired printed a-line dress and cardigan for a dress-up yet casual style. So Shoe Me a pair of stand out flats that add a personal touch to my spring wardrobe while remaining simple and chic.